"Nobody has taught me more about the right hand. He imparts to his students the greatest possible insight into elementary principles and the problems of instrumental playing. In chamber music it is the thorough understanding of structure and the selfless devotion in the service of music. He supports this without being distracted by superficial success. His courses are all around more productive than any others that I have attended." – Christian Ostertag, winner of the German Music Competition in Bonn, concertmaster of SWR Symphony Orchestra Freiburg and Baden-Baden. Violin with his father, a founding member of the Israel Philharmonic Orchestra; at the Rubin Academy in Tel Aviv with Prof. Odeon Partosh and Prof. Ramy Shevelov; at the Juilliard School of Music with Ivan Galamian and Dorothy Delay; La Crepon, Switzerland, with Maestro Joseph Szigetti. Phenomenology with Maestro Sergiu Celibidache in Paris, France. Lifelong association with Maestro Celibidache as soloist all over the world. Recommended by Celibidache and hired by Abreu to train Venezuela's El Sistema orchestra. Recorded for Sony Classics, Colombia Records, Denon, Mondo Musica. 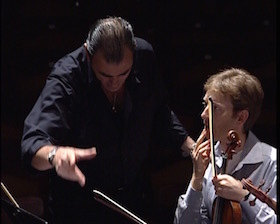 Rony Rogoff was born in Israel and was taught initially by his father – who was a founding member of the Israel Philharmonic Orchestra – and by Ramy Shevelov. He then studied at the Juilliard School in New York with Ivan Galamian and Dorothy DeLay as well as in Switzerland with Joseph Szigeti. As a soloist he was accompanied by the Israel Philharmonic Orchestra under Zubin Mehta, as well as by the leading orchestras in Philadelphia, San Francisco, Paris, Madrid, Tokyo, Manila, Caracas, the radio orchestras in Copenhagen and Stuttgart, the Munich Philharmonic, the Orchestre de la Suisse Romande and the 'Rheinland-Pfälzische Staatsphilharmonie' under conductors like Sergiu Celibidache, Leonard Bernstein, Enrique García Asensio, Aldo Ceccato or Arthur Fiedler. His solo performances of Bach’s Partitas and Stockhausen’s 'Zodiac' at the Lincoln Center in New York have achieved a legendary status and were released by Sony. Besides being in command of the complete standard repertoire, Rogoff has always dedicated himself to lesser-known but valuable works such as the violin concerto of the great Norwegian dodekaphonist Fartein Valen, of which he gave the American premiere. The long lasting collaboration with Sergiu Celibidache was the most influential in Rogoff’s professional life. Not least, the continuous exchange with many international first class artists has helped him to develop into one of the most experienced violin teachers of our time. Indeed, the teaching practice has become more and more important for Rogoff and is claiming more and more of his time. His master classes for violin and chamber music in South America, Japan, the Philippines, Italy, Austria (summer school of the Mozarteum) and Germany (working for nine years continuously in CJD institutions Elze and Berchtesgaden) have become legendary. He is a conductor and tutor for orchestras – internationally highly acclaimed – in Denmark, Spain, Italy, Japan, Germany, South America (including the nascent El Sistema) and the Philippines. In 1994, Rogoff started founding a chamber orchestra with students in Italy. Firstly situated near Vicenza and named 'I Cameristi - La Scuola di Rony Rogoff', the orchestra quickly gained an outstanding reputation and was soon invited to the renowned Italian festivals in Bologna and Venice. In Venice they performed Johannes Brahms’ complete chamber music as well as the first serenade for orchestra. The cycle was recorded live and issued on CD (released by Mondo Musica and highly praised by the media in Germany and Italy). After becoming incorporated into the Fondazione Cini in Venice the orchestra was renamed as 'Accademia Musicale di San Giorgio'. Recorded performances of demanding works like Anton Bruckner’s string quintet, Richard Strauss’ Metamorphoses, Arnold Schönberg’s 'Transfigured Night' and 'Suite in G', Béla Bartók’s Divertimento, as well as symphonic works by Haydn, Mozart, Beethoven, Schubert, Brahms, etc., demonstrate the unique qualities of this ensemble. He worked as the Artistic Director of the ensemble until 2002. José Félix Ribas Hall, Teresa Carreno Theatre, Carracas, Venezuela, November 1, 1992. José Félix Ribas Hall, Teresa Carreno Theatre, Carracas, Venezuela, February 14, 1993. On tour of the Republic of the Philippines, 1985. 1978 German television broadcast. Orchestra rehearsal (in German) precedes the full live concert performance. Bartok: Violin Concerto No. 1, op. posth, Rony Rogoff, violin, José Antonio Abreu, conductor, El Sistema Orquesta Sinfónica de la Juventud Venezolana Simón Bolivar. José Félix Ribas Hall, Teresa Carreno Theatre, Carracas, Venezuela, January 23, 1988. José Félix Ribas Hall, Teresa Carreno Theatre, Carracas, Venezuela, . December 16, 1989. Recital for El Sistema, José Félix Ribas Hall, Teresa Carreno Theatre, Carracas, Venezuela, October 10, 1992. Recital del Violin y Piano para Fundación Musical Simón Bolívar (El Sistema), Sala José Felix Ribas, Teatro Teresa Carreño, Caracas, Venezuela, October 10, 1992.